It was one month before my actual trip when i learned about it. I was tasked to browse the website of Philippine Airlines to look for possible flight schedules on the way to Bacolod. I had no idea that I am the one who will be travelling to that place so I just went on to do it without asking any questions. 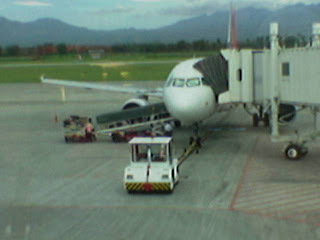 I had the flight booked for March 26 at 5:45 in the morning and the flight back to Manila on March 29 at 4:45 in the afternoon. Everything is settled. That was when I was told that I am the one who will be attending that four-day seminar in Bacolod. It was a mixture of excitement and nervousness. It's going to be my first plane ride after all! And to top it all, I won't be going on that plane with a bestfriend, a boyfriend or even a family... I'll be taking that plane with none other than... my boss! A week before our flight, I was already thinking of some reasons why I should not be the one to go to Bacolod but I can't think of anything! And I know for a fact that my boss would surely get offended when I decline the offer to go out of town on a seminar. So, I decided that I should go. It was only the day before the flight that I packed my luggage and told myself to be brave. I have been trying for days to stop thinking about it but then, this is it, it's going to be tomorrow! Naturally, I wasn't able to sleep that night. I even got up from bed before the alarm sounded off. We were in the airport an hour before the flight, I tried my best to be relaxed. We were just waiting for boarding time, we got the emergency exit seats, we've checked in our bags and we're all set. I once heard an advice that if I should take a plane for the first time, I should not take the window seats but I guess it's not my lucky day after all. I was given the window seat. Before the plane even started its engine the flight stewardess approached us and said that if anything happens they will be needing our assistance and that we should read the brochures tucked at the back of the seats in front of us. Wow, that's a big responsibility for someone who has not even seen a plane up close before! When everyone was settled in their seats and buckled up, the captain thanked everyone for choosing Philippine Airlines and the plane started to taxi on the runway. I took a series of deep breaths and braced myself for whatever will happen. But you know what? When the plane went up and left the runway, I told myself, is that it? Wow, my first ferris wheel ride is even worst than my first plane ride! All my fears vanished when we were already up there and the buildings started to get so small and I saw the beautiful sky. The fifty-minute plane ride was short after all.